Pipe thickness maps are used to assess the condition in pipelines. Thickness maps are a 2.5D representation similar to elevation maps in robotics. Probabilistic frameworks, however, have barely been used in this context. This paper presents a general approach for generating probabilistic maps from heterogeneous sensor data. The key idea is to learn the spatial correlation of a sensor through Gaussian Process models and use it as priors for Bayesian fusion. This approach is applied to the novel application of pipe thickness mapping. 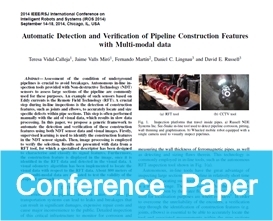 Data from a 3D laser scanner on the outer surface of the pipe and thickness measurements from a contact ultrasonic sensor are fused into a single thickness map with associated uncertainty. Moreover, a dedicated algorithm to model the ultrasonic sensor using kernel density estimation is also proposed. The overall approach is evaluated using the full 3D profile (outer and inner surfaces) of the pipe section as ground truth.